Did you know, there are many, many people who incur a financial impact during a car accident, including you, the other drivers, the insurance companies of the involved drivers, the employers of the drivers, the responders, the towing companies, and eventually (potentially) lawyers. Some of them are covered under an auto policy and some aren’t. Janice, Creative Director for a small entrepreneurial design firm, left for work early on September 1, 2015 in her Toyota Prius. She needed to get a head start on her day in order to get home a bit early that evening so her daughter Leah could use the car for the first night at her own part-time job. Janice made a quick stop at the Starbucks drive-through for some coffee and a scone, which she was consuming as she drove. When someone stopped suddenly in front of her on Route 41, she also had to stop suddenly, and her coffee spilled all over her. The shock of the hot coffee took her focus off the road momentarily, and she slammed into the car in front of her. Within about three seconds, the cars behind Janice rammed into hers at high speed. Janice’s car crumpled and she was pinned inside the vehicle, unable to get out. A good Samaritan who witnessed the whole thing helped all of those involved in the crash get each other’s contact information for insurance purposes. After first responders extracted Janice from her car and got her to the hospital, Janice was relieved to find out that, although her injuries were serious, she would ultimately recover fully. However, her many broken bones would mean she could not return to work for several weeks. As Janice lay in her hospital room, the consequences of the accident began to race through her mind. Without the car, her daughter would have a hard time getting to and from work. And Janice would be out of work for a while, unable to drive or even to walk due to her injuries. She’d be in a wheelchair for a few weeks. And what about the medical bills? Do you see any gaps or problems with the insurance coverage that Janice purchased? It’s not a trick question. It challenges us to consider how our insurance must meet our individual needs. Here is what Janice and her husband considered. Janice and her husband actually purchased these coverages carefully. Their insurance agent asked the right questions about their life, their lifestyle, their driving behaviors, and helped guide them to coverage that made sense. For example, for a couple with two cars who work close to home, such as Janice and her husband both do, rental car reimbursement coverage is probably not worth paying for. Since Janice’s husband pays for excellent medical insurance for the entire family at his corporate job, it doesn’t make sense to pay for more medical coverage on an auto policy. He also pays for disability insurance for himself and Janice through his employer, so if either of them misses work for a long period (many months) they have coverage to help them replace lost income. 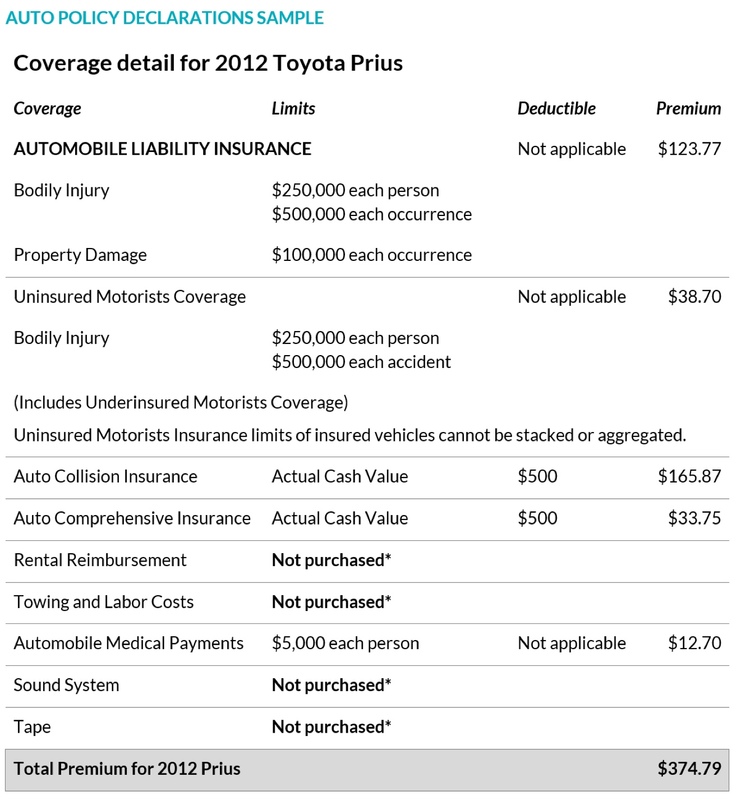 One consideration with this policy is the amount of coverage for Uninsured Motorists. For a single parent or sole breadwinner, this coverage amount should be higher than $250,000. For a few dollars more, the coverage can be brought up to $1 million, which would help take care of the family when a single parent is injured by an uninsured or underinsured motorist. One other gap that may exist is the fact that Janice’s daughter Leah just got a new job that requires driving to and from work. These types of family lifestyle changes typically require a reassessment of your insurance coverage. Janice also pays for membership in AAA Auto Club, which includes towing services, so again, she’s being careful not to pay twice for the same thing! If your car is worth less than your Collision deductible, it is not worth paying for collision coverage?